In 1981, director Mark L. Lester unleashed the action drama Class of 1984, which shows what can happen if a teacher is pushed too far by a band of violent students. Lester returns with a sci-fi version of what can happen when the teachers were once military androids who go too far in discipline. In the year 1999, violence in schools have reached an all-time high. The government have designated what is known as “free-fire zones”, which the police will not enter due to the high amount of gang activity. Kennedy High in Seattle is in the middle of a free-fire zone and the Department of Education Defense has been notified and hires Dr. Bob Forrest to try a new experiment where androids will become teachers and how to handle discipline. Mr. Bryles, Ms. Connors, and Mr. Hardin are the new teachers, who are actually androids. At first, they are somewhat able to control the students with their new methods of discipline. However, when Bryles goes too far and begins to beat former gangbanger Cody Culp within an inch of his life, Cody’s friend Mohawk shows up with a gun and Bryles murders him in cold blood. When Cody’s brother Sonny shows up completely high on the drug “edge”, Mr. Hardin proceeds to kill him in the hallways. Cody realizes something is going on and with the help of the principal’s daughter, finds proof that Sonny was killed. Meanwhile, the teachers have decided to wage war on the students by killing members of both Cody’s old gang The Blackhearts and rival gang The Razorheads. Now it’s war and in order to stop this trio of deadly droids, the gangs must unite to destroy this new form of education once and for all. Class of 1984 was Mark L. Lester’s essay about the potential of escalating violence in high schools. Here, he comes up with the idea of what will happen if the teachers, rather than the students, resort to violence to instill discipline. However, Lester adds a sci-fi twist that these new teachers are former military robots who revert back to their military form to begin a war game against the students. The result? A cult classic for the ages as let’s face it, we’re in 2015 and I don’t see any of this happening. Perhaps, it could be said today, we’re talking an alternate universe in 1999. Bradley Gregg, who perhaps is best known for being the first victim of Freddy Krueger in A Nightmare on Elm Street 3: Dream Warriors, makes for a good tough guy lead as Cody, the ex-gang member who just wants to start life over after his release from prison. He shows how much of the past is behind him when he berates his own mother as well as his brothers for their use of the new drug “edge” and even shies away from his old gang. However, when tragedy strikes, he forces himself back into the gang while trying to convince the gang that the teachers aren’t who they say they are. Gregg truly proves himself to be a leader in the latter half of the film while Traci Lind’s Christie is a typical damsel-in-distress who just happens to be the principal’s daughter. The highlight of the film are the teachers themselves, played by veterans Patrick Kilpatrick, Pam Grier, and John P. Ryan. Ryan is truly the brains and the wittiest of the trio, Grier the questionable one who tends to use smartaleck lines at times, while Kilpatrick is the brawn of the trio. Kilpatrick, usually known for playing villains, brings one of his best villain characters to the front as Bryles. He inflicts the most damage in the role. However, Ryan truly comes in at a close second with his excitement and his at times psycho demeanor. As for Grier, the one-time Blaxploitation queen has a fight scene in the film but her ultimate weapon is one not to mess with. Add to the mix Malcolm McDowell as the level-headed principal who tries to calm everything down and Stacy Keach, sporting a white mullet and white eyes as the demented creator of the killer trio and we have a definitive cult classic on our hands. 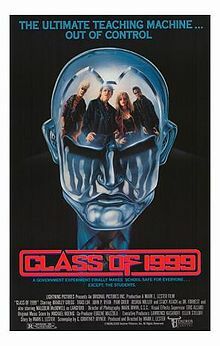 Class of 1999 is a fun sci-fi/high school violence hybrid that thrives due to the performances of th trio of veterans playing our villainous educators while Bradley Gregg makes the most of his one lead role in his career. Taurus Entertainment and Original Pictures presents a Lightning Pictures production. Director: Mark L. Lester. Producer: Mark L. Lester. Writer: C. Courtney Joyner; story by Mark L. Lester. Cinematography: Mark Irwin. Editing: Scott Conrad. Cast: Bradley Gregg, Traci Lind, Malcolm McDowell, Stacy Keach, Patrick Kilpatrick, Pam Grierm John P. Ryan, Jimmy Medina Taggart, Darren E. Burrows, Joshua Miller, Jason Oliver, Sean Hagerty, Jill Gatsby, Sean Gregory Sullivan, Brent Fraser.